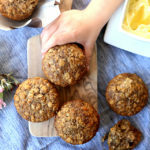 Soft and delicious chai muffins made with gluten-free flours and flax meal for the ultimate fluffy healthy spiced muffin recipe (includes vegan option)! 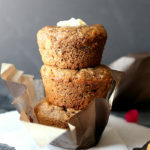 These chai muffins are one of the most delicious muffins on this blog and I am so thrilled to be sharing them with you! Perfect for fall and curling up enjoying a pumpkin spiced chai latte with them. 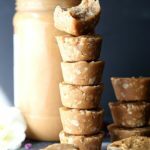 They are one my favorite gluten-free muffins (aside from this one) because they are so light and fluffy in texture with lots of chai spiced flavors that simply melt in your mouth! It took about three tries to create these to be the fluffiest and most moist gluten-free muffins! One version with yogurt, one version with almond milk and one version adding a bit of flax meal and altering the sugar ratio. It is chemistry at its best with baking, and these beautiful muffins are the wining muffin recipe that taste like a chai spice cake! I had all my boys test them all week to see if they like the one that is chewier, the one that is fluffier, and one that is the moistest. Fluffy with extra-spice-and-everything-nice won every day! Muffins are the perfect balanced meal when using these wholesome and natural ingredients. 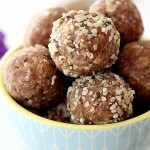 We literally eat them daily for either breakfast, snacks, as a nutritious grain for lunch and even a dessert treat that I bribe my kids “If you eat all your dinner you get muffin!” – it totally works?! The past week I have been bribing them with THIS gluten-free chai muffin and it has worked every time! Especially smothered with melted butter on top (ghee or vegan butter too!). Crazy enough even my failed batches were delicious that we devoured them too. If baking isn’t your thang, these chai muffins will be your thang because I have worked hours on perfecting the chemistry ratio. With baking always make sure to measure flours using the flat side of a knife, scraping across the top of a measuring cup to get an accurate measurement at the top. Also if you have had trouble with baking muffins, check out these 5 tips on the perfect muffin. Every muffin recipe is different, but in general, a combination of dense and light gluten-free flours is the best way to achieve the fluffiest baked good. You can get more healthy muffin recipes by searching muffins on this site or in my muffins ebook. Most of them I make on repeat each week, because WE. Just. LOVE. Muffins and a moist gluten-free muffin formula I have spent years perfecting. These muffins achieve their moistness from the blends of dense (brown rice in a flour mix) and a fluffy flour (tapioca flour) in addition to flax meal. When I work with gluten-free flours I have started to really love ground flaxseed meal in baked goods when other “hold food together” ingredients are not used such as pumpkin, apple sauce or pureed vegetables. 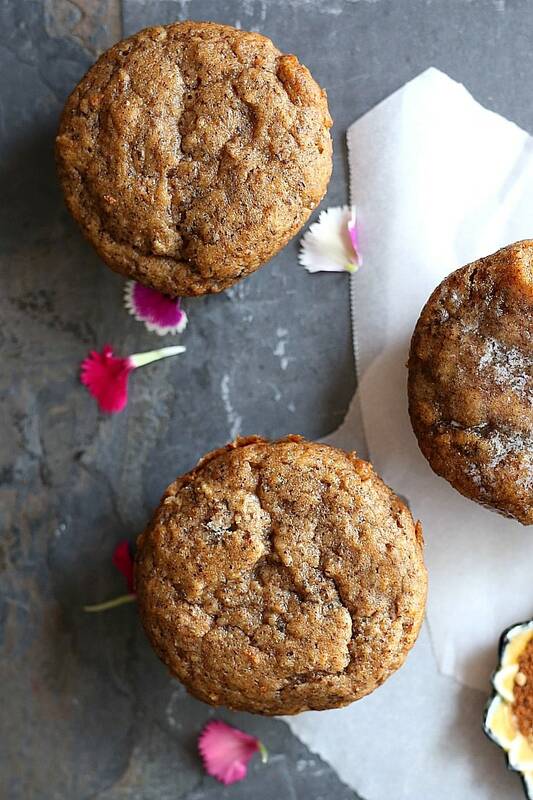 Flaxseed meal just holds these healthy chai muffins together and makes their texture light with a bakery-style muffin consistency! Can I Add Anything To These Spiced Muffins? Time to get baking! 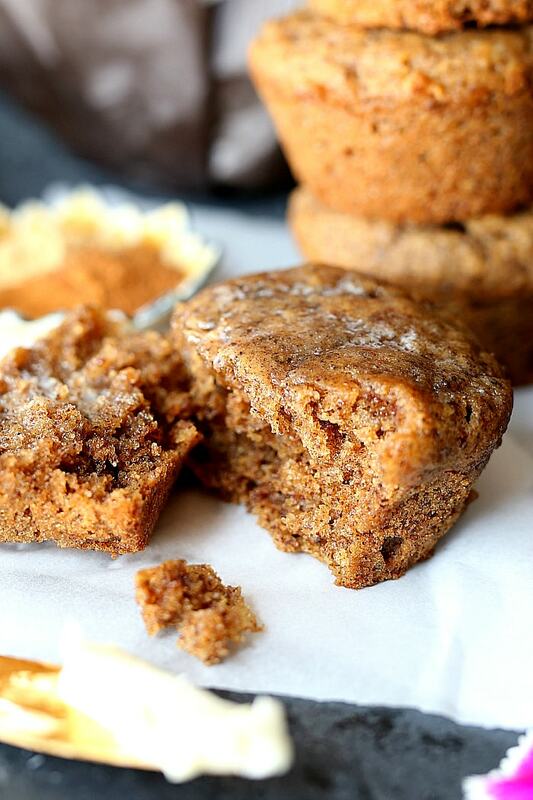 Enjoy these fall favorite delicious muffins! 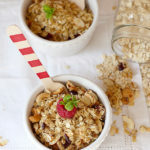 If you make this recipe I would love to see it! Hashtag me on social media #delightfulmomfood @delightfulmomfood and follow me on Facebook, Twitter, Instagram and Pinterest. 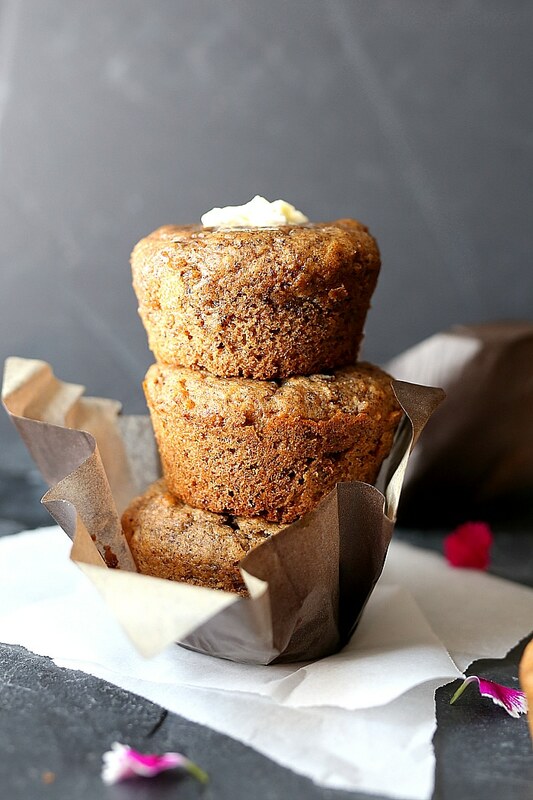 Soft and delicious chai muffins made with gluten-free flours and flax meal for the ultimate fluffy healthy spiced muffin recipe! Preheat the oven to 350 degrees F. Line a muffin pan with liners and spray the insides with cooking spray. In a large bowl combine the gluten-free flour, tapioca flour, flax meal, baking soda, baking powder, salt, cinnamon, ginger and nutmeg. Mix to combine and make a well in the center. Set aside. In a medium bowl add the eggs (of flegg) and milk then whisk gently to combine. Add the melted coconut oil, vanilla and coconut sugar and whisk together quickly so the coconut oil does not harden. Pour the wet mixture into the dry mixture and mix the batter together, trying not to over-mix it. Scoop the batter evenly into the prepared 12 muffin cups. Bake for 18-20 minutes or until the center is done when a toothpick inserted comes out clean. Let the muffins cool for a minute or two until you are able to touch them then transfer each muffin to a cooling rack to finish cooling.